Hat tip to our incredible staff members that have recently received accolades for their leadership in our industry. In the past several months, three staff members have been honored with awards recognizing their leadership, innovation and impact. Kenji Spielman, planning engineer, and Mike Bailey, engineering manager, were honored in November by Northwest Energy Efficiency Alliance (NEEA) as part of its 2018 Leadership in Energy Efficiency Awards, which recognize individuals and teams for their outstanding collaboration, innovative solutions and significant contributions to advancing energy efficiency in the Northwest. Kenji and Mike participate in the Commercial + Industrial Lighting Regional Strategy Pricing Data User Group, which was awarded the Leadership in Energy Efficiency Award for Innovation. Comprising contributors from Bonneville Power Administration, Northwest Power and Conservation Council, NEEA, Avista and Energy Trust, the User Group created an interactive dashboard to give utility planners, program managers and implementers access to effectively real-time pricing data for commercial lighting products. The new pricing data dashboard has been welcomed enthusiastically by the region’s electric utilities and other nonprofits, and is already being used by them to support customers purchasing energy-efficient lighting. 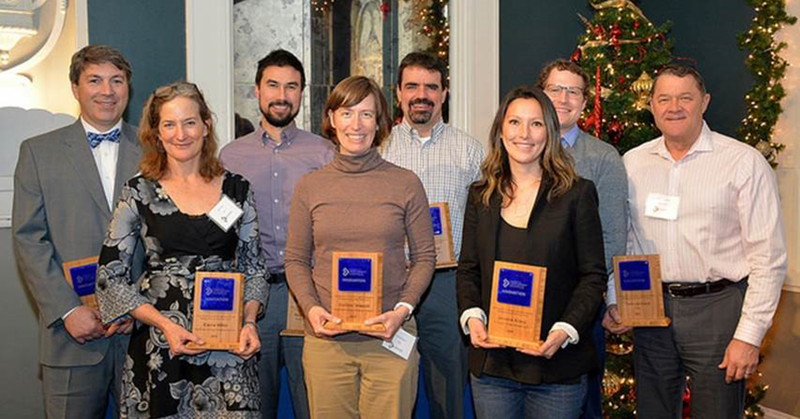 Mike, Kenji, their fellow collaborators and other winners of the awards were recognized at a NEEA board meeting on December 4. We also want to acknowledge Andy Eiden, planning project manager, who was among the nominees for the Leadership in Energy Efficiency Award for Collaboration. In October, Debbie Menashe, director of legal and human resources, was recognized as one of the 2018 Daily Journal of Commerce Women of Vision. From among nearly 100 nominations, Debbie was selected as one of the recipients of this honor. The DJC Women of Vision award recognizes women who excel professionally, are active in the community and help to create a pathway for women to excel in the architecture, engineering, construction, real estate and related industries. These women shape our region’s built environments with leadership, mentorship, community involvement and promotion of industry diversity. Recipients of the award, including Debbie, were celebrated at the DJC Oregon Women of Vision event October 18.